Who's at fault for the lack of ethnically diverse roles for actors? In recent years there have been several heated debates over the quality of roles written for BAME actors. The Oscars in 2015 were dominated by stories and studies discussing why the Oscars are so heavily skewed in favour of white actors and filmmakers. Ever since, it has become almost inevitable that each ceremony will be sidetracked by campaigns such as #whitewashed and #OscarsSoWhite. As the months and years roll by, such tensions show little sign of easing, which isn’t helped by continual disagreements over the root cause of the issue. Some claim that the lack of in-depth BAME characters is caused by an undercurrent of racism that exists in the industry. Others blindly insist there’s no issue at all, that the creative merits of each project are unique, and that this is fake news. This year (2018) has seen the release of two films with the potential to buck many historical trends. Black Panther showed that an all-black cast can be part of a franchise that’s right up there in terms of filmic quality and box office success. To me, the notion that this was ever in doubt is pretty sickening, but now at least the doubters have their proof. Secondly, Get Out defied racial stereotypes in an intelligent way, rightfully being rewarded with a host of prestigious awards and nominations. In terms of showing diversity though, I’m not sure these films count given that they were written and directed by two wonderful BAME filmmakers, Ryan Coogler and Jordan Peele. For me, a black writer creating great roles for black actors is the same as a white writer creating a great white role, so the true sign of progress would be if writers were creating strong ethnic characters across the board. As a writer myself, I can’t help but feel responsible for the society we live in. After all, we are the ones putting the content out there in the first place, so roles can only be cast in accordance to the parameters we set. It was when reading the comments of Joel and Ethan Coen in a 2016 article that something inside me clicked. And this is where the problem lies. From a creative standpoint, I fully agree with the Coen brothers. Good writing is always about what works for the story, and so that should always be what leads the creative decisions. However, writers are also schooled on principles such as, ‘Write what you know,’ and as most writers in the industry are white working class men, is it any wonder we’re experiencing such a problem? The subject of why there aren’t more female writers, or BAME writers, is one for another time. But when considering whether the lack of great ethnic roles is directly linked to the ethnicity of the writers, I took a closer look at some of my own recent work. For some reason, I seem to write most projects around strong female protagonsists, rather than men (go me! ), but I did notice an acute lack of ethnically diverse roles within my recent scripts and outlines. Being that my dearest friends come from such various races and backgrounds, I was keen to drill down on why this is happening, and I think I’ve found the answer. In 2012, I wrote a crossover film, titled The Adored, which was a low budget contained thriller. For those who aren’t familiar with the term “crossover,” it refers to a film that appeals to both straight and gay audiences. I remember attending a screening, which was incredibly well received, and when I took the stage for a Q&A, many members of the audience turned cold when I revealed I was straight. I distinctly remember the oddity of the straight viewers embracing my take on open sexuality, but many LGBT members adopting an attitude of, ‘How dare you write about us.’ It was a bizarre incident, and one that I feel has stayed with me to some degree, perhaps to the point I’ve found it easier to steer clear of certain challenges now when writing. The realisation that that night might have, to some degree, held back my writing in terms of diversity is actually quite painful. After all, the whole point of becoming a writer was so I had a way of expressing myself and my beliefs. So I wonder how many other writers have such restrictions stunting the diversity of their work? How many people decide against depicting characters of ethnicities they know little about through fear of getting it wrong? Of being misunderstood? Of being told they should never have explored the topic in the first place? What if a white filmmaker had made Get Out? Would the audience have reacted the same? Would it’s Oscar nomination have been viewed as a promotion of racism, as opposed to a parody of it? Could it be that the undeniable racism inherited through our history, mixed with the term, ‘Write what you know,’ is responsible for stunting the growth of ethnical diversity in casting? Some people may say that a good role is a good role, and that the ethnicity of the actor playing it shouldn’t matter. But creatively, when developing a character, any writer worth their salt will create a back story for them. These back stories intertwine with the other characters to create context, and everything about their past informs the decisions the characters make. So although it may seem like changing a character’s ethnicity is a small thing, it does risk altering the intentions of the writer, which is definitely not okay. Therefore, I feel the focus should be on getting writers to branch out on their characters’ background within the conceptual stages. Rather than play the blame game, I’ve decided to be active in finding a solution to this because unless my work is representative of the people in all walks of life, what chance am I giving BAME actors? Whether we like it or not, we writers are part of the problem, and we always will be unless we change our thinking. I’ve recently been working on a new play, titled The Banker’s Daughter. In the initial outline, the premise revolved around the relationship of two white male friends, but when I asked myself if that was important to the plot, the answer was no. These characters are now black and asian, and suddenly there are depths to the story and strands of humour that didn’t exist before, so I’ve found the process of challenging my own ideas to be really refreshing. It seems that this consideration wasn’t in my process before, so having a slightly new mindset makes me feel evolved as a writer. 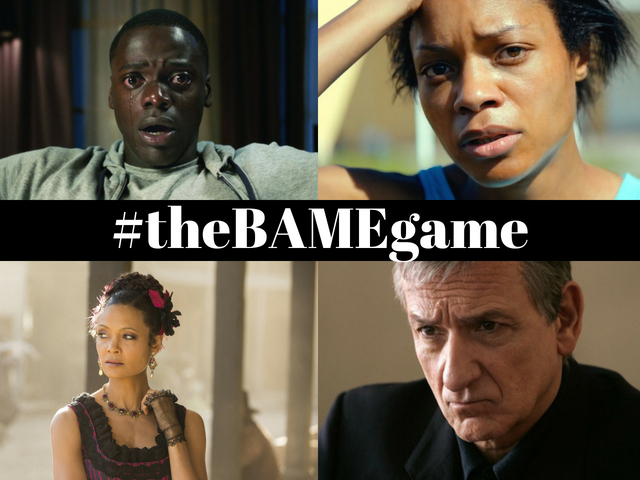 I feel invigorated, and I’d like to encourage all writers to develop a BAME-driven piece and roll it out under the campaign #theBAMEgame, which will help promote diverse casting within the arts. Alongside this, I’m also developing an original play of the same name that will tackle the subject of race, and why we’ll always be better off when race isn’t an issue. To stay updated on the progress of The BAME Game and other projects and events run by Pen Works Media, feel free to join our mailing list. Loving the campaign and want to create some content together? Get in touch on jody@penworksmedia.co.uk to discuss blog, vlog, interviews and podcast opportunities.